And a chicken named Cluck Norris. 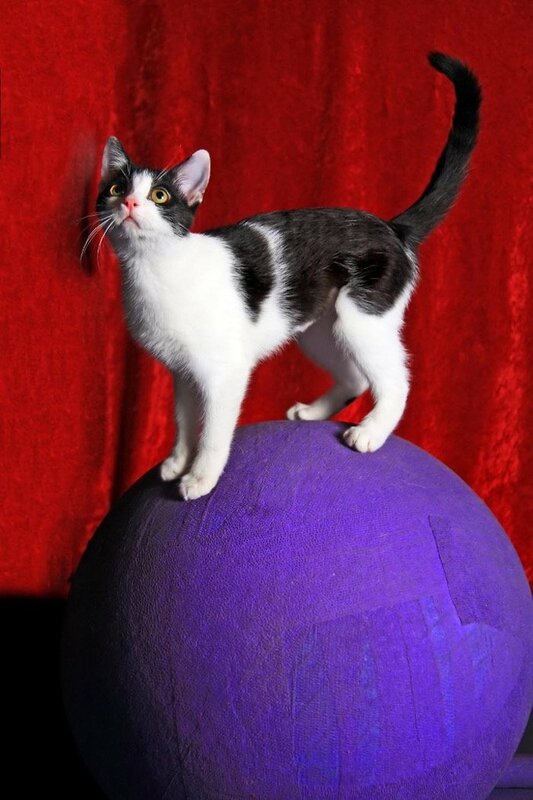 We’d like to introduce you to the one, the only Amazing Acro-Cats! 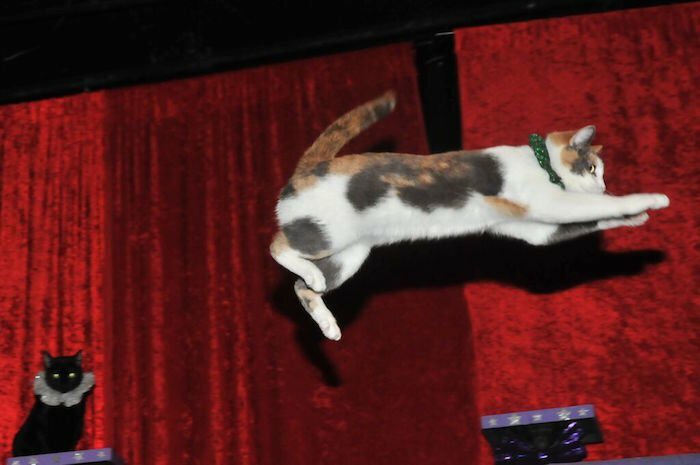 A touring cat circus, Acro-Cats is a total dream come true for every cat lover, ever (it’s basically like watching all your favorite cat videos from YouTube, only IRL) and you, you lucky, er… dog you, they’re coming to your town this summer. 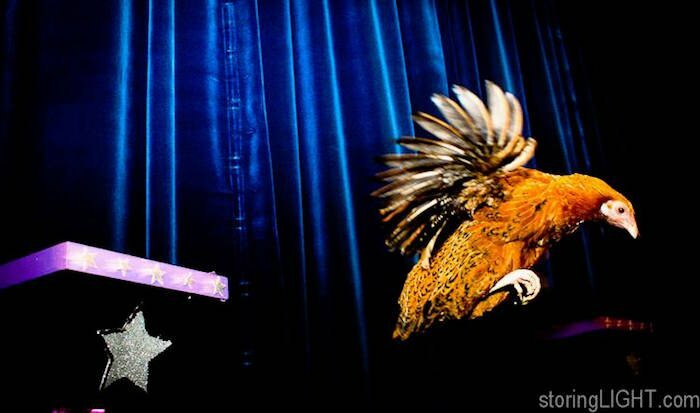 These talented feline’s are ready and waiting to knock your socks off, and our very own Lindsay DeLong attended the show in Los Angeles to give you an up close and personal look into the lives and talents of our furry, four-legged friends, their humans and the group’s token chicken. Tuna the inspiration and official star of the show. 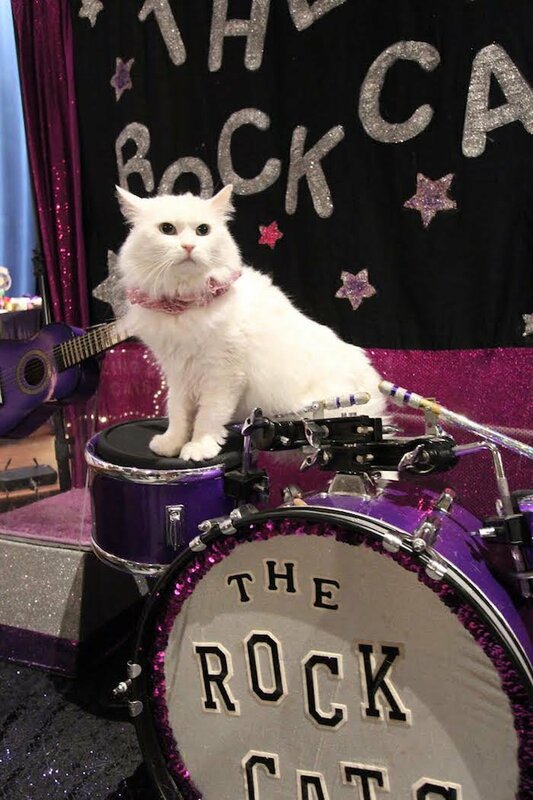 She plays cowbell in Tuna and the Rock Cats and also serves as manager…of course. She’s the epitome of #girlboss, and boy is she bossy! 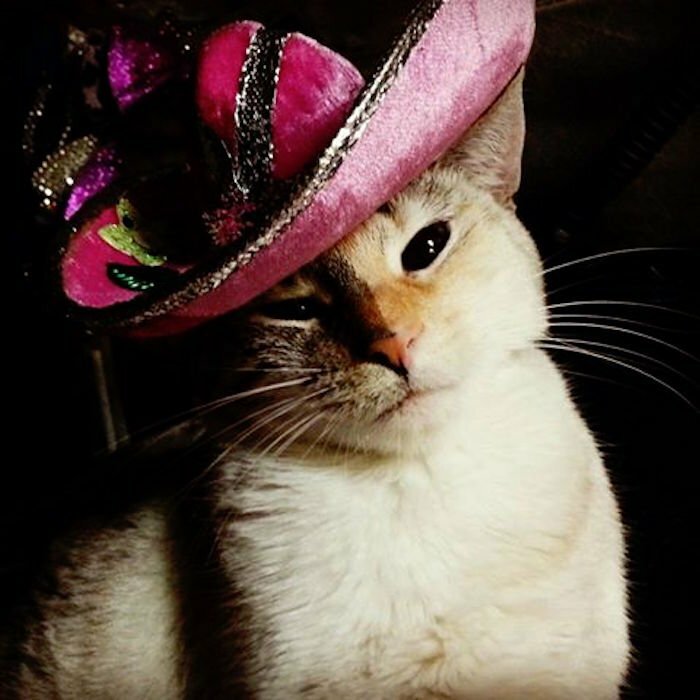 She hates balloons and clowns, but loves to high five. She’s been featured in a commercial for Petco and even a film where she played the part of a killer cat. Beware! Tuna does not like to cuddle. 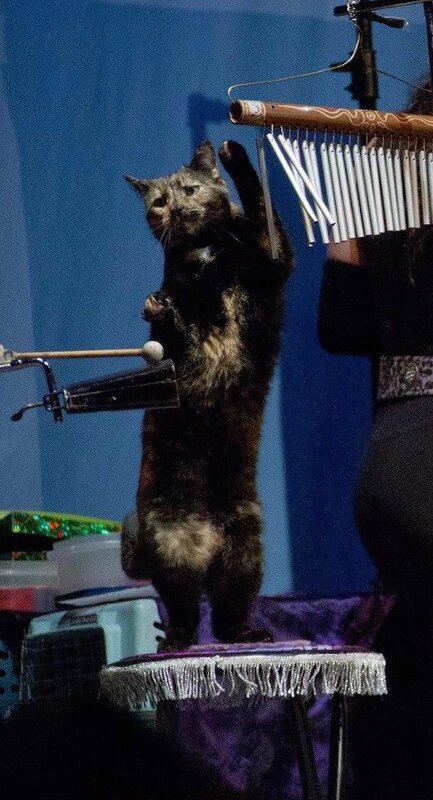 CHO (Chief Human Officer) is the mastermind behind the Acro-cats. 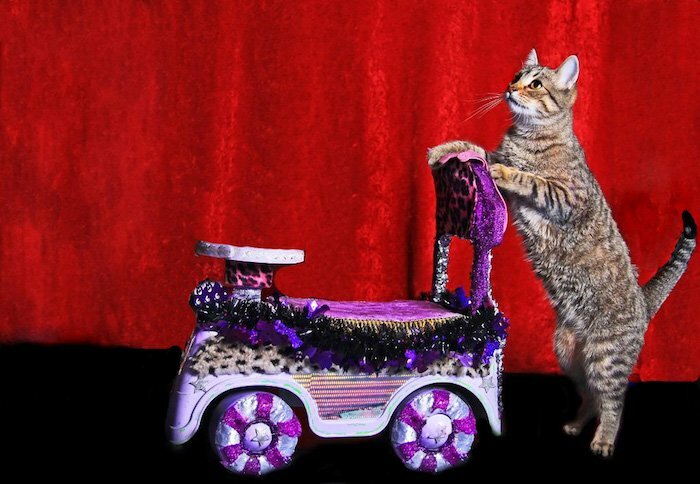 Inspired by a desire to inform the public that cats can, indeed, be trained, she created her cat circus and travels the country in a cat-painted bus with all her furry employees. She won’t say how many cats she has, but will say she’s single. The chicken of the group, (literally) enjoys ringing bells and bowling, and is not at all bothered by his furry feline counterparts. One of only two boys in the group, he wears a jester collar and enjoys jumping through hoops covered in tissue paper; spinning pinwheels and playing guitar in the band. Samantha has had him since he was two days old and calls him her “meow-acle” child. 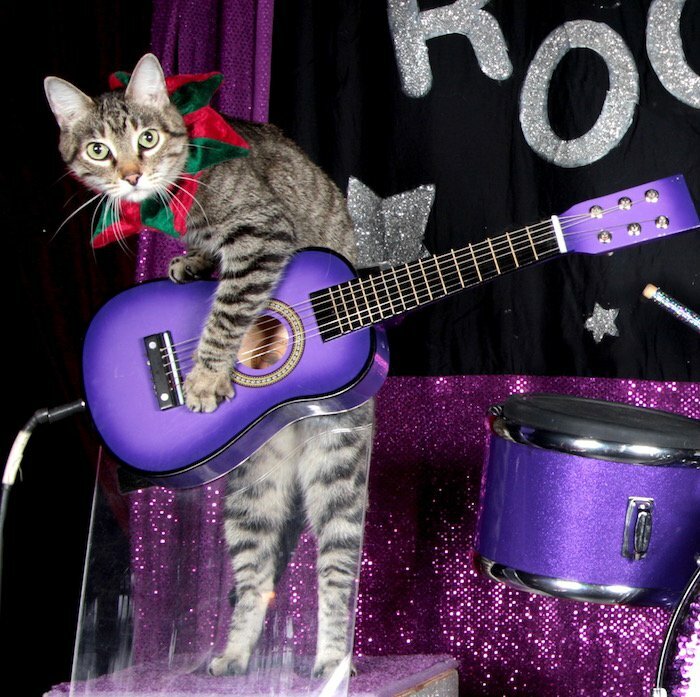 Tuna’s daughter and bandmate is a keyboarder for the Rock Cats. She loves to stretch and sleep, in no particular order. 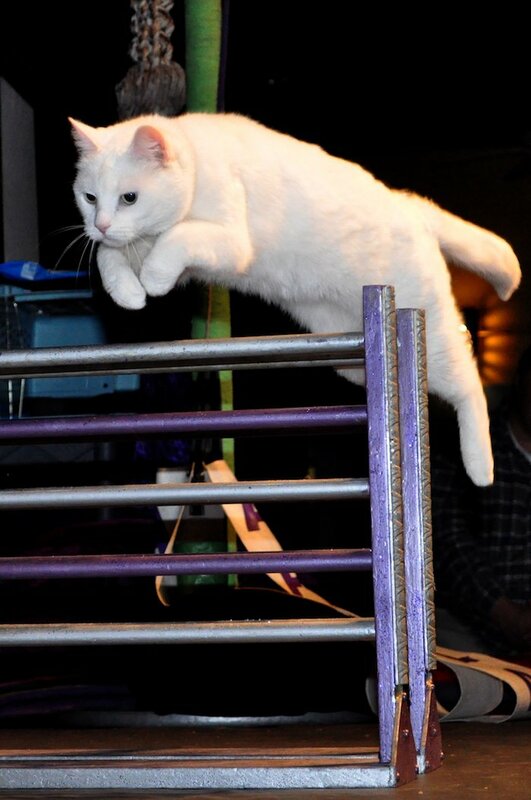 The current record holder in the Guinness Book of World Records for Cat Making the Longest Leap, she also enjoys weaving in and out of her human’s legs. Sports aren’t her only hobby though, she’s also active on Pinterest where you can follow her at @alleyacrocat. Sookie loves shopping! She even has a pint-sized shopping cart she pushes around. Hide your cash though! She absolutely cannot pass up a big sale—50% off? She’ll take it all! She’s also the chime player for the Rock Cats. Has to pay her bills somehow! Nola loves being in front of an audience, but loves stretching even more—she’s seriously more flexible than a runaway slinky. She jumps through glittered hoops and dons an equally sparkly collar. She was found in the back of a pickup truck at just five days old, but has quickly settled in to her newfound kingdom. 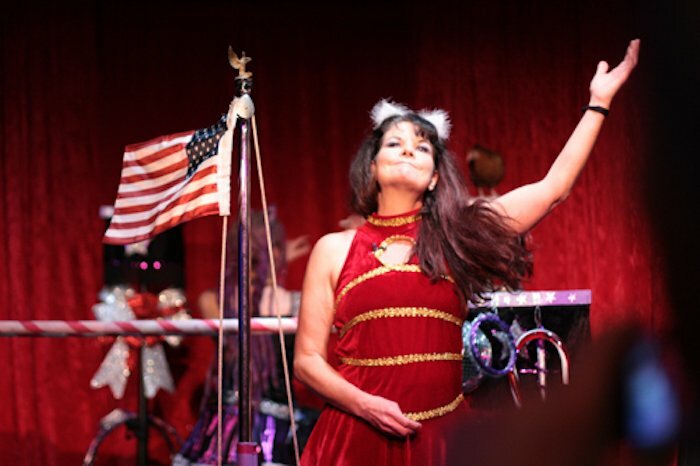 After each show she sits patiently on a red heart cutout on the floor and calmly takes in all the action. Please, no touching the princess though! She’s simply there to observe the humans and to let us all gawk at her regal beauty. Found on the side of the road when she was just a little thing, she’s now a giant grey furball, and one whose sole purpose in life is to get pet! Mobs of strangers don’t phase her one little bit. 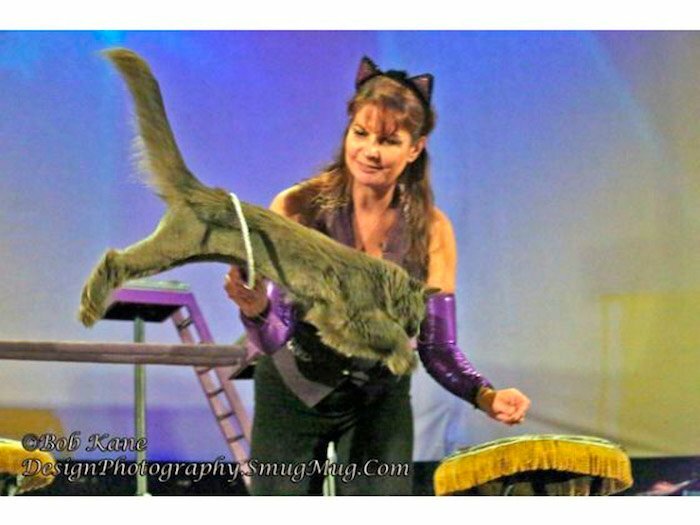 She’ll stay after the show on a stool purring, head-butting and doing everything she can to ensure your hands stay on her fur. You’ll want to take her home, guaranteed.  The only other male in the show, Wiki loves to flirt with the audience. It’s not uncommon for him to leap off the stage to wander amongst his spectator’s feet, slyly rubbing his tail on anyone and everyone’s legs. He likes rough petting, starting from the head straight down to his hindquarters—the e-pet-ome of a typical boy. A young orphan (her mom was killed by a coyote), she’s adapted purr-fectly into the Acro-Cat family. She enjoys climbing poles and jumping from them onto Samantha’s back. She’s quickly developed a taste for the finer things in life—Belgian waffles anyone?— and also “drives” a tiny car where she blares Rock n’ Roll, which makes total sense considering she serves as the headlining drummer of the Rock Cats. The backup drummer for the band, she is mostly known for her good looks rather than her drumming skills. She usually only comes out after the performance for photos on the tom-tom’s, but always ends up being a fan favorite. Beauty, I’m telling you, it gets you places. 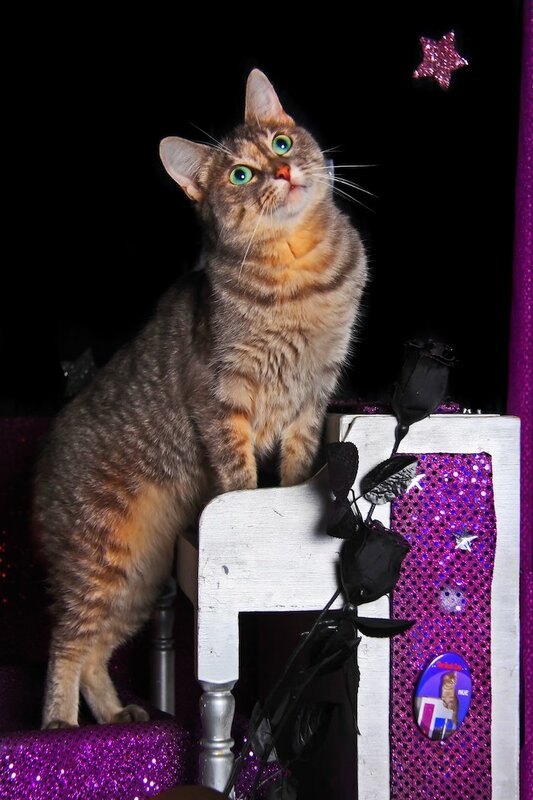 Buggles spends her time watching all the action from atop a 10-foot tall perch throughout the entire show. She comes out first but goes directly to that perch. She’s kind of like Samantha’s wing-woman—just there to offer her support. 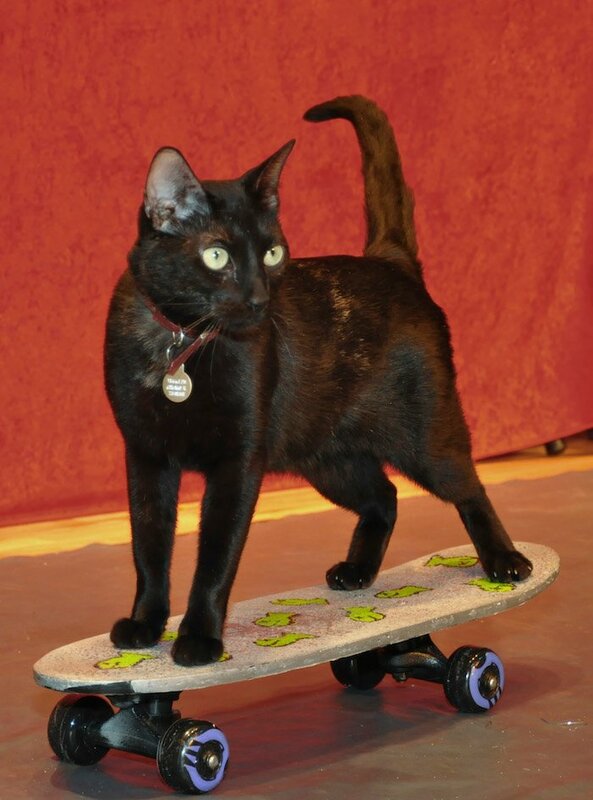 She likes to skateboard and prefers the company of humans as opposed to the other cats. Jax was left at a truck stop in Illinois, where she learned her street smarts. She grew up the bully of the family, always beating up on her two bigger brothers. These days Jax loves yoga and is about as sweet as can be. She’s even active on Twitter (@jaxacrocat), but prefers to talk in only acronyms. HP Jax, HP! 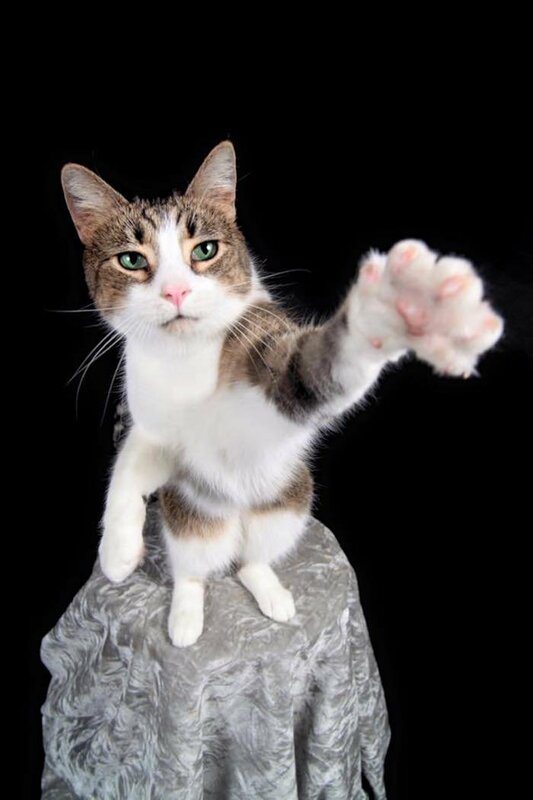 Oh, and for those of you who aren’t familiar with the latest cat jargon, it’s “high paw.” Now get outta here! Jaimie Rain They found a 5 day old kitten in the back of a pick up and stole it?? Mons Felix Great post! Follow this link to our latest video: www.youtube.com/watch?v=kNfJ7Urqq1c If you share some of my videos/channel on your social networks, i will do the same for you. Thanks!